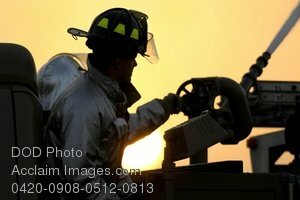 Description: Free, public domain image: Air Force Firefighter Operating a Water Cannon. Senior Airman Chad Engman and Airman 1st Class Abe Barragnon, firefighters assigned to the 379th Expeditionary Civil Engineer Squadron, operate a water cannon Dec. 1, at an undisclosed air base in Southwest Asia. The water cannon at full power will empty its water tank in one minute. A daisy chain approach is used from a fire hydrant to a filler truck and finally into the truck which will fight the fire. Airman Engman, a native of Cincinnati, Ohio, is deployed from Beale Air Force Base, Calif. Airman Barragnon hails from Los Angeles, Calif., and is deployed from Travis AFB, Calif. Both are deployed in support of Operations Iraqi and Enduring Freedom and Joint Task Force-Horn of Africa. (U.S. Air Force photo by Tech. Sgt. Michael Boquette/Released.